No, I believe it: It really may be time. You and Facebook just aren’t getting along. You are losing money running ads, and you don’t have the time or resources to manage a page. Maybe you don’t trust Facebook, and you’re tired of all of the changes. You’re convinced that Facebook is out to screw you, and will do all they can to force you to buy ads. So do it. 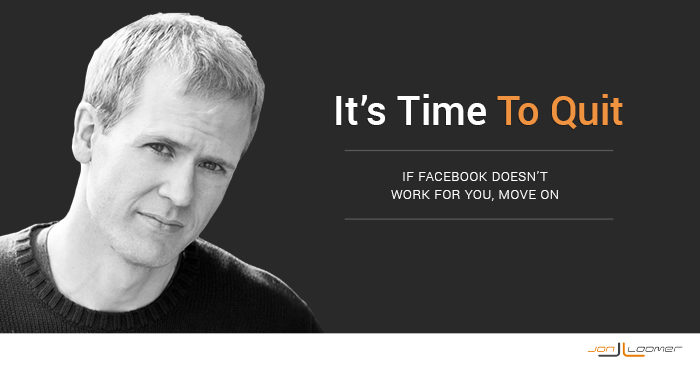 Quit marketing on Facebook. I’m serious. For a while there, everyone was sharing photos. “They” said photos got the most engagement, so you did what they said. You even used photos when sharing links — pasting a URL above the image — because, you know, link reach and engagement were terrible. But when text updates got the most reach, you started sharing links to your website as an ugly URL without a thumbnail image or description. Then Facebook said that brands were ruining photos and links, so they adjusted the algorithm to favor links shared the old fashioned way and punish those who attempted to game the system. You were angry because you had to adjust again. 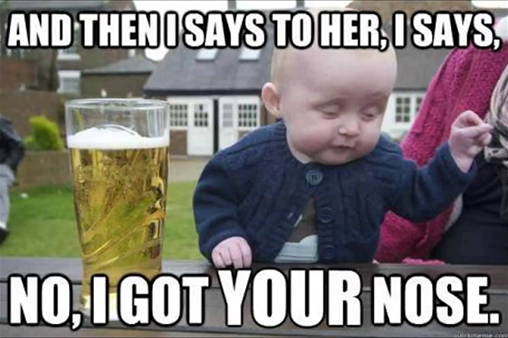 But you did. So you started sharing links, but you used click bait headlines to draw people in, even though those people ended up being disappointed by what they found and didn’t stick around. You posted memes because they attracted the most engagement, even if that engagement was meaningless. Facebook then adjusted the algorithm again for marketers like you, punishing click bait and memes. You were angry and getting tired of having to constantly adjust your strategy based on Facebook’s latest algorithm. At that point, you were exhausted. Creativity is hard without memes, click bait and the ability to game the system. So you just sold your crap all day. At least then you could get a positive return on your efforts. You needed sales, and Facebook was giving you a free way to do it. And you certainly weren’t going to give Facebook your money to run ads. 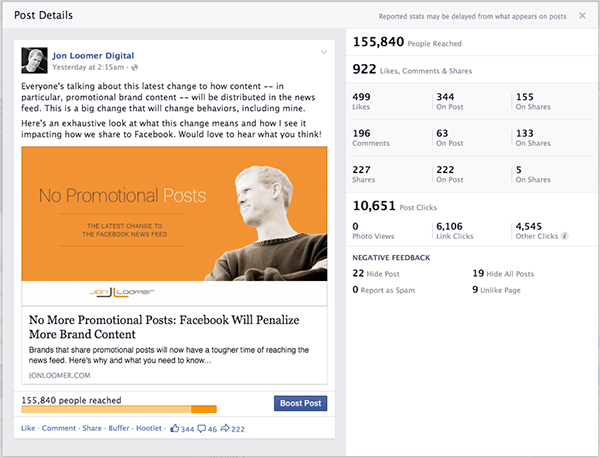 Facebook then adjusted the algorithm to punish brands that use organic posts to sell things. Hey, I don’t blame you. It’s exhausting chasing an algorithm. And when you do, you’re essentially a puppet as that algorithm pulls the strings. Maybe you didn’t do all of these things. But those who care most about algorithmic changes are those who chase them. When satisfying an algorithm is your priority, you lose control. And being out of control is a really crappy feeling. I can tell you that my posting strategy has barely changed during the past three years. I care very little about Facebook’s algorithm. Focus has always been on providing the highest quality content possible that appeals to my target audience. It’s all about reaching the right people with the right message at the right time. 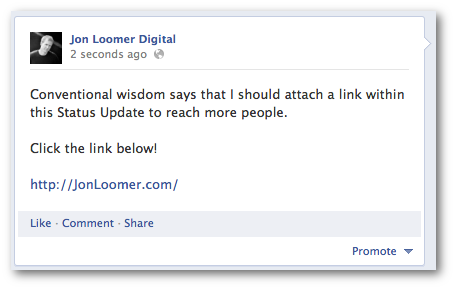 I’ve always shared links. Lots of them, algorithm be damned. If you want to continue to give Facebook a shot, you need to accept something: The news feed algorithm is designed to serve users the content they want to see. If you don’t believe this, you should just quit now. I see you rolling your eyes. Don’t even waste another minute of your time. But if you come to grips with that sentence, you will gain a better understanding of your place on Facebook. Once you accept that your fans care more about their friends’ content than yours, you’ll find a peaceful place in the Facebook universe. People come to Facebook at a habitual rate to share, argue, congratulate and empathize. Their friends are the stars while the pages they like are the side show. When you share, you need to keep this in mind and it needs to alter your expectations. 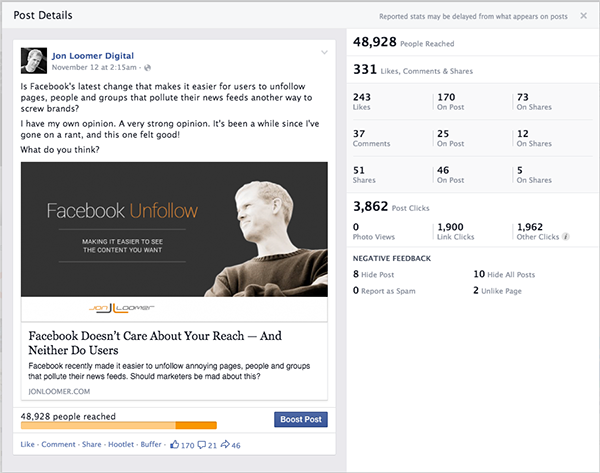 When they liked your page, it wasn’t an explicit opt-in to see every piece of content you ever write. In fact, most don’t care if they never see a post from you — ever. If you are, then cool. Continue on this crazy Facebook journey. If not, it’s really not worth it. Facebook’s news feed algorithm is here to stay, and filtering is likely to get worse as more people and businesses join. It’s a battle you’ll continue to fight, and you’ll always lose. Back in the good ‘ol days when we were kids, you were reaching 50% of your fans with a single post. That was awesome, right?? Then more people started using Facebook. Millions of businesses saw the opportunities for this free advertising. 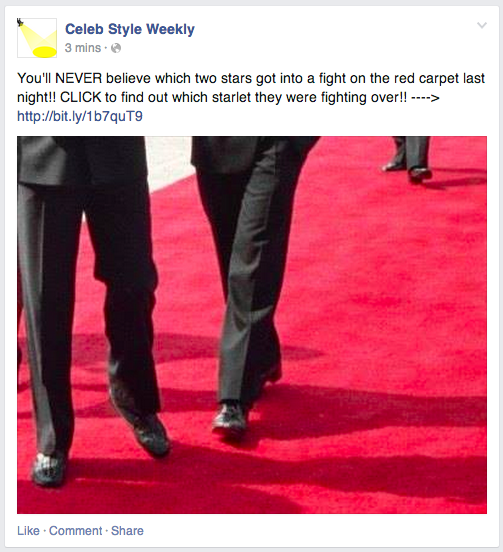 And suddenly there was some crazy competition in the news feed. Facebook has always filtered their feed, but that filtering quickly became more pronounced. If you’d typically see 1,500 stories in a day, Facebook showed you only 300 — skipping stuff from friends, groups and pages that Facebook didn’t think you’d care about. I know, I know. Facebook doesn’t know what you or anyone else wants. I’d argue that they know more about what you want than you do. They have the data of every click and action on the site. They know. They tested the hell out of this, trying to find the right combination that would lead to the most engagement and time on site. Because end of the day, they need users to stick around for as long as possible. But that meant you — the business — started reaching a lower percentage of your fans with a single post. Before, you’d always fail to reach a large chunk because they weren’t online when you posted it. But now Facebook started keeping you from reaching those who actually were online — more and more. Then you started reaching about 25%. Then it was 16%. Then it was 10%. Then it was 5% and even less. I understand it’s frustrating, but is Twitter any better? Will you reach more of your followers with a single tweet — because the feed is unfiltered? Is Google+ any better? Where a lower percentage of those connected to you show up to read posts every day? If you’re convinced that the grass is greener on the other side, hop on that horse and trot through the pasture. The average business with fewer than 1,000 fans reaches 22.9% of them with a post. The average business with between 1,000 and 10,000 fans reaches 12.8%. The average of all pages is 9.0%. I know that’s not 50% (or 25%, 16% or 10%), but is it really bad that 9% of your fans — regardless of whether they were online when you posted — saw a given post? We’re freaking spoiled by what “once was.” Facebook gave us a lifetime supply of chocolate, and now they only give us a month’s supply. But again, you have to wonder… Of your 10,000 followers on Twitter, how many see that single tweet? You know, that tweet that gets buried 60 seconds after you write it? It’s small. But I know what you’re thinking: Reach of a single tweet doesn’t matter because I tweet multiple times! I’ve never understood why we obsess over reach of a single post on Facebook either. If you monitored the reach of your posts over a given day or week, you might be surprised by what you see. But none of this really matters to you. It’s principle. Facebook is keeping you from reaching people for free you once reached easily. Sometimes change for the sake of change is a good thing. I want the Brewers to fire Ron Roenicke to hire another hack who will be just as bad. Sometimes it’s the mere act of change that can refocus and energize you. I have serious doubts that you’ll reach more people on Twitter. But that doesn’t mean you won’t have success with it. If you do pick up and move everything from Facebook, be sure to track that Twitter reach and let me know what you find. Now that your reach has dwindled, you’re convinced that the value of a fan is no more. All of that time and energy. Worthless. In some cases, those fans might be worthless. You might have run a constant stream of sweepstakes to increase the number of fans, under pressure from higher ups. 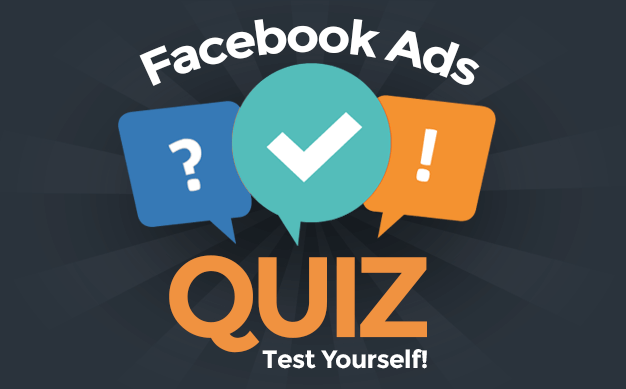 You may have run poorly targeted ads, focusing on price and quantity over quality. Hey, you may have even resorted to buying fans (but we’ll keep that between us). If you did these things, you’re absolutely right. Your fans are completely worthless. Maybe you didn’t do these things. Maybe your audience is more valuable than you think. Maybe your audience is worthless now, but it has potential that you didn’t know existed. I can tell you with 100% certainty that my page’s fans aren’t worthless, and I know the fans of many pages are hugely valuable. When I shared this link the other day, it drove 4,545 people to my website. Most of that was organic. They’re all recent and didn’t use any lame tactics to game the system. Just good old fashioned, boring link shares. Traffic to my website is extremely important to me. The fact that I can drive this much traffic with a single post — with and without advertising — is like having a second powerful email list. I don’t share these to brag. Only to show what’s possible — and after three years of really hard work building a relevant audience of fans to help get these kinds of results. My fans also convert, which is why building an audience of highly relevant people is the first step to my four-step Facebook sales funnel. Oh, I know just what you’re thinking: But Jon! We can’t share promotional organic posts anymore! You are correct. And really, those organic posts that push products don’t perform that well for me anyway. That’s why I use ads. Yeah, fans convert. They convert at a very high rate. I get registrations for anywhere from $.50 to $2, depending on the campaign. Here’s a collection of nine campaigns that were created to drive fans to register for a webinar. At or under $1, a total of 1,397 conversions for an average price of $.76. The main reason for this is because I was targeting fans. If you don’t believe in the power of the like, you should believe in the power of a subscriber. You own that email address. They can now enter your funnel. Fans also buy. I wrote about how I got a 35X ROI (49X when targeting fans) last year on ads that promoted my first training course. I then ran an online offer that netted a 10X ROI. Understand that I’ve said time and time again that it’s not easy selling high priced items on Facebook. Well, that course has been sold for $297 and $347 (most buy the bundle). Last year’s course was sold for $73.50 to $147, which undoubtedly helped the conversion rate. I’ll even track conversions when running a campaign that isn’t specifically promoting a product. Crazy thing is that I’ll see high return on some of those posts, too. You know what the common theme here is? I get these results from targeting two groups: My fans and my website visitors. Do you know why I do this? Because it’s much, much harder to sell to people who don’t know me. In fact, I don’t even try anymore. So, yes, fans have a whole lot of value. I see it every day. It’s why I’m so focused on building that relevant audience. If you’re a true conspiracy theorist and cynic — and there are plenty who have argued this — I only get my results because I write about Facebook. Fine. Assume that. And if you actually believe that’s true, it’s one more reason you shouldn’t be marketing on Facebook. Look, I get it. You don’t trust Facebook. You think Facebook is evil. They are doing horrible things with your data. They don’t respect your privacy. They are keeping fans who want nothing more than to only read your content all day long from seeing it. They’re doing all they can — but they won’t succeed, dangit! — to force you to pay for ads. Mark Zuckerberg is the devil. They’re jerks. Did I cover it all? This may be a bit over the top, but I see so many of these comments every single day. It’s crazy to me that I see so much of it on Facebook and in the comments of my blog posts — posts that are always about Facebook advertising. If you think these things about Facebook, why are you there? Why are you even thinking about marketing or advertising there? You know what I do with people and companies I don’t trust? I make sure not to have anything to do with them. I don’t give them my money. I don’t give them my time. I avoid them at all costs. I know it seems unavoidable because everyone and their moms are on Facebook, but it’s not a necessary evil. If you think these things about Facebook, why in the world would you give them a single penny or minute of your time? Stop doing it. You’re torturing yourself. You’re violating your own values, and it’s gotta feel dirty. You’re at the front of every Facebook conspiracy, and you’ve finally had enough. It’s time to move on. 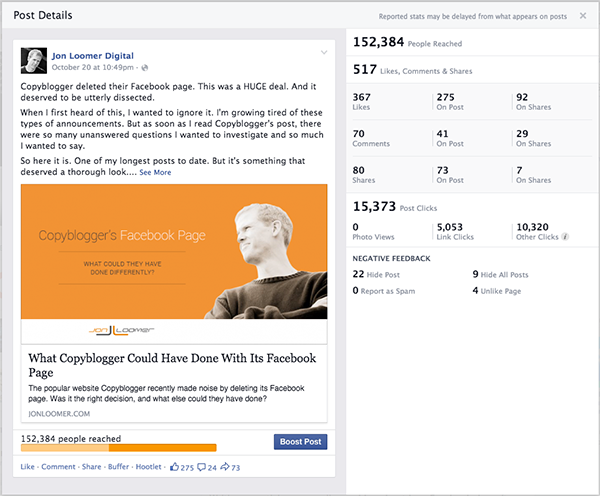 Creating Facebook ad campaigns that work is a science. It takes time and a whole lot of patience. There is no easy button. Well, there is the Boost button, but while that may be easy it isn’t the foundation of Facebook advertising success. It’s easy to get Facebook ads wrong. It’s easy to think you’re finding success when you’re really not. 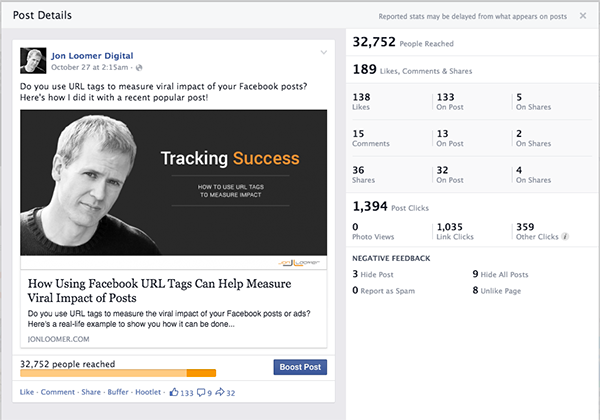 You boosted those posts that resulted in a ton of engagement (but nothing else). You built your fan base by targeting interests, not bothering to limit your audience by country. You saw great “results,” but you were following the wrong numbers. Or maybe you tried to sell your product and got no response. Or you wrote a post vaguely instructing users to subscribe to your newsletter, but didn’t see a trickle. Or maybe none of these things, but you simply couldn’t get Facebook ads to work. There are hundreds of reasons why that may have been. Some could be due to the industry you’re in. But more often than not, it goes a whole lot deeper than that. It could have been the copy. It could have been the imagery. It could have been the landing page (oh, I’ve seen some awful ones!). It could have been the product. It could have been the bidding. It could have been the placement. In all likelihood, though, it was the targeting. Rewind to the stories about results I see targeting my fans and those who visit my website. I don’t consider myself a good copy guy. I don’t have the most creative imagery. But I’m targeting the right people. If you don’t build a raving fan base by targeting those who know you, their loyalty will be paper thin. If you don’t promote posts to increase website traffic by targeting those who have visited your website before, expect to pay more to get the click. And if you don’t use the four step sales funnel to target those most likely to buy, you shouldn’t expect a sale. But doing this takes a lot of planning. It takes plenty of analysis. It even takes a whole bunch of failure. That’s fine. Facebook may not be for you. Look, finding success on Facebook is hard. Creating content that people want to see is hard. Running ads that convert and lead to a positive ROI is really freaking hard. But do you expect it to be easy? These are difficult skills. There are more businesses who ARE on Facebook than who AREN’T. As a result, there will be a whole lot of failing going on. You know what else is hard? Creating a successful website that attracts traffic. Building an email list that converts. Algebra is really freaking hard. These are all difficult skills. If finding success on Facebook, creating a successful website, building an email list that converts or completing that ridiculous math problem are too much, it’s okay. Not everyone can do those things well. But it’s also not necessarily your fault. You may be in a really tough niche. You may not have the expertise. And you may not have the time or resources to make it work. That’s completely fine. Stop wasting your time on something that isn’t working for you. Go find something that does. More and more marketers are voicing their frustration with Facebook. This isn’t a surprise since it’s a crowded, crowded space, and it’s becoming “survival of the fittest” up in here. But you know what? You don’t need to continue being frustrated. If you move on, it’ll be okay. And in the end, that may just be best for everyone. This rant is the result of my own frustration hearing from those who constantly complain, all while having the option to change. It’s meant to be somewhat light-hearted and underscore that there is an option. What do you think? Is it time for more marketers to quit Facebook?